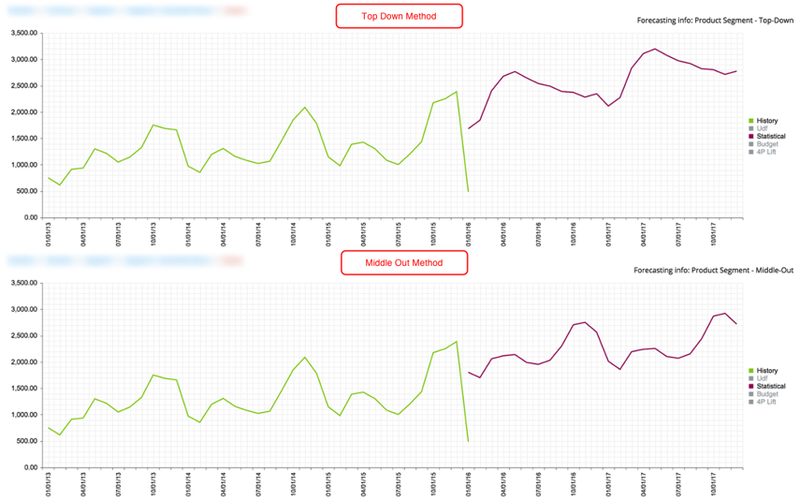 There are two primary forecast aggregation methods available in DemandCaster. Top Down is the most common method used. Top down aggregates demand at an upper level of the hierarchy, generates a forecast at that level, and distributes it down to the lower levels of the hierarchy with a percent distribution. The level chosen can be at any level including the item level. Middle Out is an expansion on top down in that the forecast is generate at two levels, an upper and lower, and then combined in a proprietary manner to form a composite forecast. An example of each method is shown in the examples below. 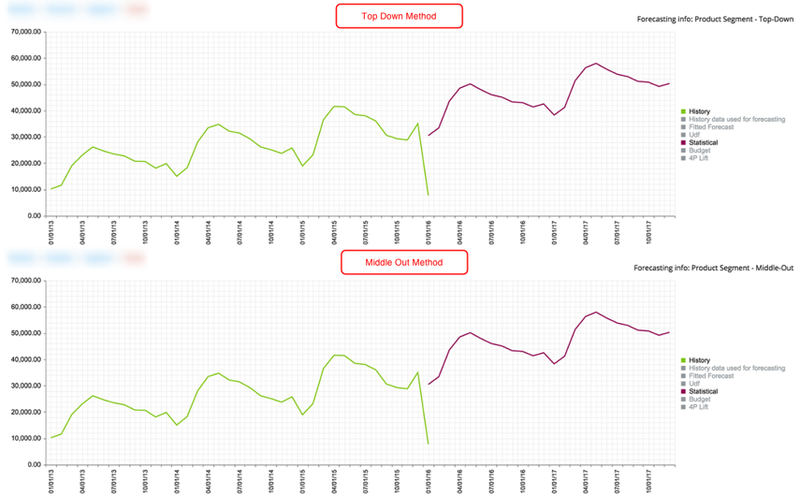 The examples below are an example of a top level forecast using the top down method and middle out methods. As can be seen, the statistical forecast at the top level is nearly identical for both methods at this level. Both methods have a forecast that follows the historical pattern quite closely. There are differences in the forecast values because of the influence of the lower level forecasts. The examples below are an example of a lower level forecast using the top down method and middle out methods. As can be seen, the statistical forecast at the lower level using the top down method has the identical shape of the top level forecast. It is simply a percent of the top level forecast distributed down. The middle out level, however, results in a different forecast at the lower level. The lower level is more closely influenced by its own history as opposed to the top level forecast. The negative of the middle out method is that it takes a lot longer to run since the number of statistical forecasts that need to be generated, increases exponentially. We do recommend running middle out when there is a clear seasonality at the upper level that is not as defined as the lower level. This way, you are able to generate a hybrid item level forecasts that is influence by both patterns. We recommend bottom-up when the item and customer/channel/market relationship is 1 to 1 and each item has its own discrete pattern. For most companies, however, running a top down forecast at a low enough level where the demand pattern is captured, is the best approach.